DEKORASI SIMPEL DAN MODERN UMB.. AFTERNOON DELIGHT: PLAY WITH F..
Everytime I hear the word ‘ukulele’ and ‘Hawaii’ together, I instantly remember Israel Kamakawiwo’ole and his breezy version of “Somewhere Over the Rainbow/What A Wonderful World” medley. The late singer use an ‘ukulele as his instrument. (A ukulele. Or An ‘ukulele? Actually both can be correct. Hawaiian pronounciation is ‘an ‘ukulele’). So when Rachel told me about her tour inside the ‘ukulele factory in Hawaii, that medley song kept playing inside my head while I read her story. “Tour a ukulele factory” was at the very top of my Hawaiian bucket list – underlined, circled, and highlighted in bright neon yellow. It was a slow Tuesday morning in Honolulu (the parentals had some business to attend to), so I decided to catch a hotel taxi and make my way to Kamaka Hawaii. “Hm, what’s that?”, I mumbled. “You said YOU-kelele. Here on the island it’s pronounced OO-kulele” replied the cab driver. Tucked away in a small industrial area between Downtown and Waikiki, the Kamaka Ukulele store looked rather humble from the outside. “Welcome to Kamaka Hawaii!”, shouted the lady behind the counter. “Are you here for the 10:30 factory tour?”. The aunty (as we would say so in Hawaiian), asked me where I was from and we chatted for a bit while waiting on other people to show up for the tour. Let me point out that I absolutely LOVE Hawaiian people. Most of the ones I met were incredibly warm and friendly, and made me feel like giving those aunties and uncles a big bear hug. The store walls were covered in pictures, posters, and plaques all showcasing the achievements and popularity of Kamaka ukuleles. There was a picture of George Harrison strumming his prized Kamaka instrument, and beside it a movie poster of 50 First Dates, in which Adam Sandler showcases his custom Kamaka uke. Positioned in the center of the wall, right behind the cash register, was a dated photograph of a man. According to the fine text underneath it, he was Samuel Kamaka Sr., founder of Kamaka Ukulele. Suddenly, a figure emerged from the back of the store and walked towards me. He introduced himself as Fred Kamaka, son of founder Samuel Kamaka. Fred is in his late 80′s, and when he spoke of the his dad’s legacy and the company’s history, I couldn’t help but feel chills running down my spine, in awe of the scene I found myself in. The Kamaka story is very fascinating, and I strongly recommend you give it a read here. After our history lesson/discussion which lasted about 45 minutes, Fred took me to the factory. As we walked outside and behind the store to where the factory was located, he told me today was a special tour as the “entire group” consisted of me, and myself. Being the friendly guy he is, Fred was gracious enough to run the tour despite there being only one guest that day. Here are some pictures from my private tour. 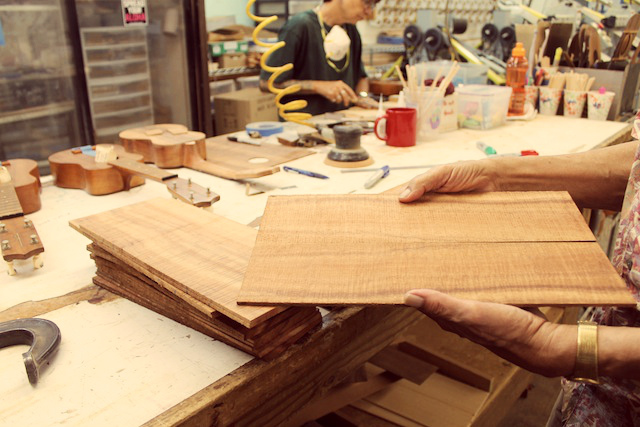 very uke at the Kamaka factory is touched by the hands of at least 20 craftsmen in the building process. The Beatles’ George Harrison particularly favored Kamaka’s. He would buy out all Kamaka Ukes in a local Maui store and give them as gifts to his friends. Kamaka Ukes can be seen on: Beatles’ “Anthology” DVD. Adam Sandler also holds one on the movie poster for “50 First Dates”, which was filmed in Hawaii. This may sound incredibly cliché, but my visit to Kamaka Hawaii was breathtaking, wondrous, and awe-inspiring. It was all that I fantasized it would be and more. Visiting an‘ukulele factory is an experience that I HIGHLY recommend. Much love, or aloha, to the Kamaka Hawaii family. Note: The ukulele factory tours is available from Tuesday to Friday at 10.30 AM. 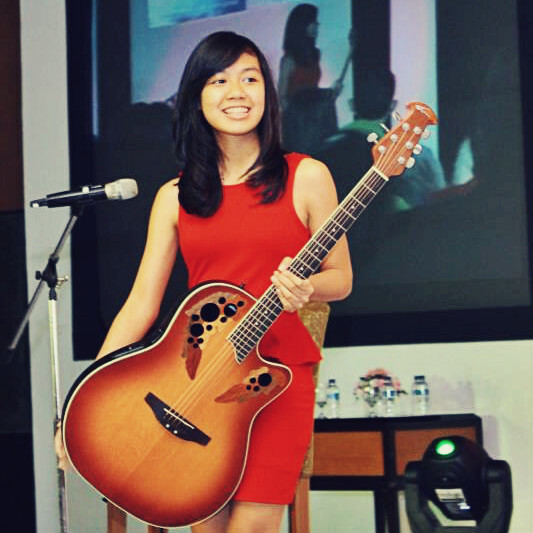 For more info and other interesting stories about Kamaka ukulele, see their website here.